It was time for some long overdue recharging of batteries. We all needed it after our last boring busy period. To round it of, we traveled to Holland for business for the week - again - and spent the two weekends trying to catch up some of the time lost on the family's favorite place, the beach at Kijkduin. Without me knowing it I was carrying a little gift in my travel bag. 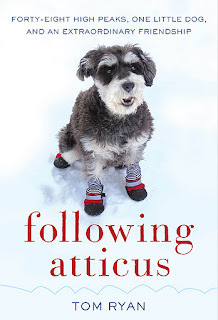 Edie started a book club on her will my dog hate me blog. Although I missed the discussion about the first book from Steinbeck, due to the mentioned busy period, I was prepared and had a copy of Following Atticus - by Tom Ryan and Atticus M. Finch - for the next installment of Edie's book club packed for the ride. After both Kenzo & Viva were laying down after another active day and went to rest for the remainder of the night, I made the mistake to open this book and read the first couple of pages. Just reading the prologue was enough. I was hooked and unable to stop reading until I finished it. I am burning to tell you all about it, but will not at this time as it is Edie's party. So tune in to Edie's book club session on her blog on December 8 where we can all join and talk about this wonderful book. It is a story about hiking. And a story about dogs. But it is so much more than that. After you read it, I am sure you will see your dog - and your life as well - through different eyes. Please read and join us! 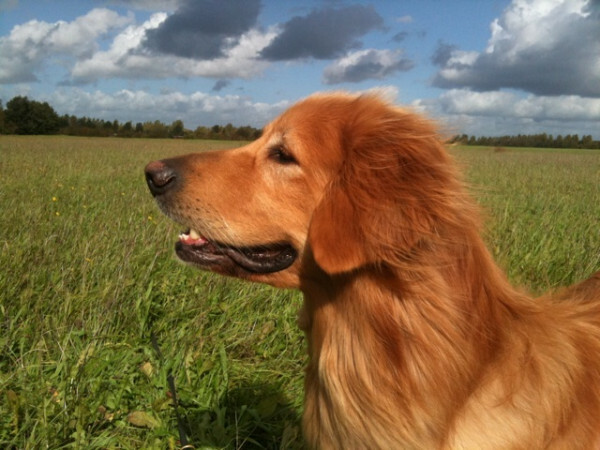 Dogs learn from each other and copy behaviors of each other. For Viva I hoped she could benefit from Kenzo, observing how he interacted with other dogs, and how he handles situations that would otherwise impose fear on her. The exact opposite happened. Viva is making good progress – thanks to BAT (Behavioral Adjustment Training) – but Kenzo is going in the opposite direction. They are copying alright. But it is Kenzo that is doing the copying, not Viva. Looking back, Kenzo’s change in behavior already started to develop ever since our very first encounter with an off-leash dog together with Viva. Viva snared at her, and the other dog snared back. Kenzo stepped in between the two ladies before it could escalate any further. He did not snare or growled, just moved in between them while making himself as large as possible. The other dog left. I thought it was just Kenzo being his diplomatic self, like he has done so many times before. This scenario repeated itself with other dogs. And then one day Kenzo decided to act in a preventive way, and moved in between before the other dog could reach Viva at all. And in small increments, he became a little more persuasive as well. Without me noticing it - I was glad for the help while in the background trying to somehow keep Viva from going berserk -, he was learning a lesson I did not want him to learn. Aggression can pay off. In the mean time Viva became a lot more relaxed due to the progress we made with her BAT training. She became so much more relaxed that I could start doing some “Look At Me” with her on our walks. When another dog approaches, I can use it to have her focus on me. She can still respond to a “Look at Me” only meters away from another dog. Kenzo gave “Look at Me” a different meaning. For him it was a signal another dog was approaching – which in itself was correct - and he made himself ready to scare them off for Viva. Instead of looking at me, he would scout the surroundings for any dogs and locked in on them as a guided missile system. 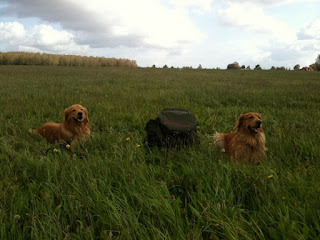 No matter how much I tried training it with Kenzo separately, on a walk together with Viva, Kenzo mistook it for a warning that danger is approaching. Now I found myself in a situation where Viva was improving, but Kenzo was clearly in a downward spiral. Not something I would have expected, to say the least. And I needed to fix it fast. I discussed it a lot with my Twitter pals, and while I chatted about it with @kimhalligan1 and @positivelydog, I got some great advice. 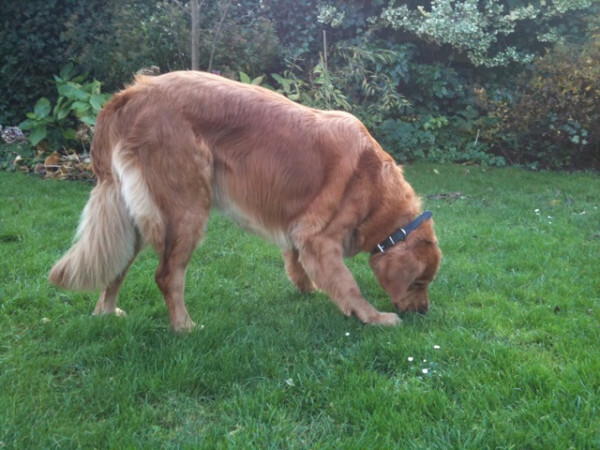 According to @positivelydog Kenzo was an info-seeking dog and with them “Look at That” (LAT) works better. That meant I actually had to reward him for looking at the other dog, instead of trying to have him to look at me. She sent me this LAT video from Leslie McDevitt – author of “Control Unleashed” - and off we went to try it out. It was easy to train, as I can reward Kenzo for what is natural for him. 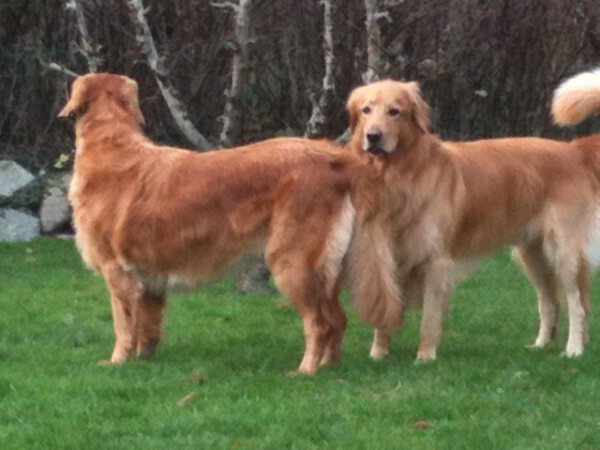 When we are on a walk these days, we are just asking for a “Look...”. Viva looks at me, and is rewarded. Kenzo scouts the horizon, finds the dog, I praise and he looks at me for a reward. Jackpot! It is such a small thing when you think of it, but it makes a huge difference. Having regained focus of both Kenzo & Viva once more we can move forward again as a team. The negative downward spiral Kenzo was in has been stopped. We started treating Viva for her Cushing's disease more than half a year ago, and soon we were confronted with a harmless side effect. Viva's hair growth was exploding. Cushing's had been suppressing her natural hair growth so far. And now it was rapidly returning to it's normal state. In Viva's case, that meant a lot of hair. 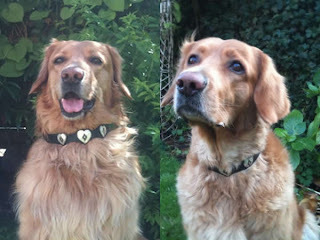 She quickly developed a "Lion collar", any Hovawart male would have been jealous of. It couldn't be comfortable for her having that much fur. And it wasn't very lady-like. When I read on Pamela's blog how Honey grew "Muppet feet" and how Pamela executed some do-it-yourself grooming with great results, I went to arms. Viva needed some wellness. Thankfully I started on the area below the chest, a little out of sight. My few existing grooming skills, if any, seemed to have gone with the wind. I had to give that up and I frantically started to search for an alternative, while Viva's "Muppet feet" where developing into "Muppet flippers". Armed with a list of test questions on how to groom a reactive dog, I called around to local groomers but was left empty-handed. Nobody seemed to be able to refer us. Not in the dog training club, not the vet. Finally, we got a tip from Viva's water-walker therapist. She gave me the contact details of a groomer that she knew could handle reactive dogs. When I called for an appointment, we got a time two months away. When the day finally came I told all there was to know about Viva and her reactiveness to our newly appointed grooming-lady, Jannie. She nodded politely through my whole monologue, and reached for the leash to take Viva in. I didn't expect her to do that, as she was physically absolutely no match for Viva and assumed she would need my help getting Viva crated in the bathing area in the back. But Jannie, nodding politely again, said it will be alright and off she went with 90lbs of highly-explosive Hovawart. The longest 3 hours in my life started. I think I phoned Jannie at least twice. "yes, everything is alright", and "no, Viva is not ready yet". When I could finally pick Viva up, I rushed into the shop. One groomer was busy with a Corgi mix and Jannie was grooming a Poodle on her table. When I started to approach Jannie and said hello, I noticed a blondish shadow was rising from below the grooming table the Poodle was standing on. It was Viva, and she was off-leash. I panicked, expecting Viva to lash out to the Poodle. I reached for her, in what felt like being in one of those movies where you see the hero flying through the room in slow-motion while shouting "noooooo...", equally in slow-motion. She was too far away for me to reach. The only thing I could do was to hold my breath in a feeling of helplessness and accept the laws of gravity. But the Lioness didn't roar. Viva rushed passed both dogs and made a whole spectacle out of greeting me, and the remaining dogs in the shop happily joined in for the concert. Viva had been taking a nap at Jannie's feet while she continued grooming other dogs. My jaw-bone must have reached the floor on the very moment I realized that. I was so baffled and relieved, I was not capable of having any kind of intelligent conversation about it. Jannie did not give a lot of detail either that could explain Viva's exemplary behavior: "She was nice". Most important, Viva was B.E.A.U.T.I.F.U.L as well. Her fur was soft from the bath and her trimmed coat had the highest cuddle factor. The Lion's collar was gone as well. 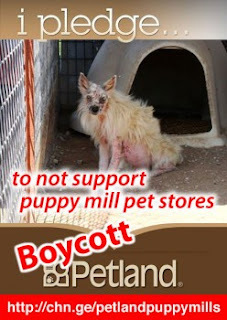 In an attempt to have Petland USA follow the example of their Canadian branch to stop selling pets from their pet stores that come from puppy mills, a petition was raised. In just one month it already gathered more than 45,000 votes. When confronted with the results, Petland management decided in all their wisdom to ignore the results and even made up a genuine conspiracy theory. As a response, a call for action from change.org, the BTC4Animals team and Mary Haight from DancingDogBlog was organized to join a social media protest for a boycott of Petland USA. Everybody could join by placing a "pledge" badge on the FB walls of the Petland franchises. In an attempt to stop the bad publicity Petland USA closed their FB walls. WE SHOULDN'T LET THEM GET AWAY WITH IT. It is appaling they can still turn a blind eye for the practices that are going on, continue to sustain puppy mills that use dogs as breeding machines. Kept in small cages and never seeing the light of day. In Europe this was banned 2 decades ago, Petland Canada stopped selling pets through pet stores. Other chains in the US stopped as well. Clearly Petland USA knows this. But they choose to ignore it and make money on the suffering of dogs. Join this action and take the pledge by sharing the badge on your FB wall, blog or other social media. And lets keep on voting and sharing the petition as well. During some crazy weeks for the business in which we worked like madmen on a bid for three huge "call for tenders", life had to wait. Walks were just sufficient. No tracking. No training. Kenzo's activities suffered the most. I canceled his mental test in our show or neuter project, canceled ring-training, canceled mid-week obedience classes, canceled the tracking exam. Viva's vet visits, the holiest of the holiest, were of course uphold. She is in thriving health, and the latest Cushing's test with blood work came back just fine. I even got her groomed, but that is a different story. Kenzo & Viva seemed to quickly adapt to the new routine. Spending their time waiting for the happy days to return. I worked a lot from home, conveniently keeping my own guilt feelings at bay. Being the active dogs they are, I expected a lot more protests and new "behaviors". Apart from occasionally stealing some laundry and taking their self-invented guarding duties a little more serious than usual, nothing out-of-the-ordinary happened. No need to say that the first thing we did today - now all work was "finished" - was to go out for some well-deserved tracking. After Kenzo finished jumping up on me and slobbering my face, he did his best imitation of a vacuum cleaner, while Viva provided a background barking choir, in anticipation of her turn to track. They have just been waiting. Politely and patiently. Happy days have returned. And while I write you this short note on what we have been up to, Kenzo & Viva are laying at my feet, in a deep and fulfilling sleep from a couple of hours of nose work. Just how we like it. And how it should must be. I know I'll have to do this smarter next time. On top of all I forgot, when you bid on a "call for tender", you can occasionally win. And that's what happened, we won one already. A decade ago I spent a lot of time on books and seminars about balancing work and life and postponed getting a dog. How ironical. All those lessons were in vain and I needed a dog to get the message across. Now I only have to act upon that.